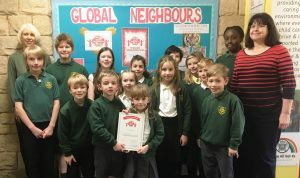 We are very proud to have been awarded the Bronze Award in recognition of our wide-ranging steps to ‘love our global neighbour’ through events involving recycling & saving energy to Fairtrade fortnight and learning about the Rights of the Child. Having gone as far as the Silver Rights Respecting Schools Award, we decided to complement this with a slightly different emphasis which we feel fits best with our status as a Church of England school. There are three levels of accreditation: bronze, silver and gold. These are verified by Church of England Education Office assessors, who look for evidence across five areas: school leadership, teaching and learning; collective worship and spiritual development; pupil participation; and community engagement. Global Neighbours is a Christian Aid initiative designed to encourage children to become courageous advocates for the common good both globally and locally. The accreditation scheme celebrates schools that are helping pupils learn about global poverty and the Christian responsibility to tackle it, as well as giving them the tools to play a confident part in creating a fairer world. We are thrilled to be recognised for the work we have done as a whole school community to raise awareness of the extreme inequalities across our globe and perhaps more importantly, the steps we can take to address these. The pupils learn about global issues in lessons and through collective worship which helps them to gain an understanding of injustice in our world. Our team of Global Neighbours and Eco-Saints have worked hard with the support of their teachers, Julie Brown and Jill Leggett, to encourage us to recycle and to care for the planet. We think it is vitally important that our young people learn about the world they live in so that they can take their place as global citizens! To read more about our achievement, please read the report by The Star newspaper. 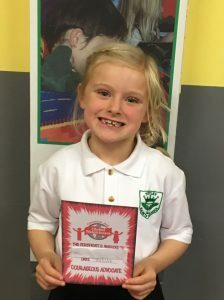 Our Global neighbours can be very proud of all of their achievements in leading the school – all with the help of Mrs J Brown (Y2) & Mrs Leggett of course! Y6: Joseph Blanks, Issey Campsill, Guy Eckersley & Jessica Camateras. The children meet every few weeks with Mrs J Brown & Mrs Leggett.